Millions of sardines, the immensity is a phenomenon! It was a quick decision to revisit one of my favorite destination in Cebu province, initially we were aiming for an offbeat town in Southern Leyte but unfortunately, the lone local dive shop was fully booked for that weekend. We made quick arrangements on our favorite hostel and dive shop in Moalboal but then again, all were fully booked. We ignored the hindrances though, coming to this favorite town southwest of Cebu was a joy. My last visit was yet in June 2014! The last minute changes made me scrambling from a quiet lunch with friends, it was already past 2pm and everything else went as a whirlwind – tickets, packing, gears assemble, so on. By 8pm, I was already on board the boat sailing for the night to Cebu. Got away from the crowd to get unobstructed view of the sunset! Therapeutic morning dip at the falls basin! Being with the sardines was a joy! Completely lost in their midst! The swarm is getting larger! DM Cameron (of Cebu Dive Center) was just good-hearted to arrange with another diver for our afternoon dives, one dive was truly not enough for me but it was better than none considering the long trip. The afternoon waters was turbulent as it was moving for the high tides, it was hard to keep steady as we wade for our entry. At 15 meters though, we had a grand show of million sardines. It clouded above us, as we swam coyly in the warm waters – so beautiful and surreal! It was amazing, a nature’s wonder that can not be explained. For a time the swarm was in the deep in Pescador Island, but now it’s in the shallows right next the shores. Maybe, the fishes knew that they can survive well away from the predators. Yes, the spot is a protected area and fishing them is illegal! I knew I will get back in Moalboal for the sardines again and again. The brief get-away was a carouse but never in a noisy and lively way as in a party, but it’s about enjoying nature’s gifts in it’s most simple, relaxed, spontaneous and unaffected way. The wonderful dive was just I needed during the Moalboal visit. After we bade goodbye to our host, we left for the city thankful that our traspo connections went fluidly. NB. All photos courtesy of my favorite dive buddy. Heights and depths are both nature’s display of its wondrous splendor! Adventures for the intrepid can be as varied as far one can go, many travelers have become so audacious and ambitious as if motivated in conquering one goal after another. After years of diving and continually aiming for off beaten sites, I realized there are still a lot of places around the country that needs to be explored. I have learned so much from my travels and in many ways have gained new insights especially destinations that are closest to nature. The rural scenery is almost and always a plethora of learning and new understanding of our culture, the environment and wide issues of protection and preservation. There are few places that are close to my heart, destinations that are perhaps distant and advance arrangements are necessary, yet the urge to keep coming back was hard to resist. Much that I love the depths, I am always fascinated by heights. So that, a combination of both in a trip, is a real indulgence, actually a luxury. Climbing a peak or searching the depths is a real show of grandeur in all scheme of things! One of my favorite dive destination is Coron due its collection of World War II wrecks, the underwater museum have tickled my curiosity and I have tons of write-up about the mysterious wrecks. I was always blown away every time we penetrated the old ships, these silent monsters abandoned in the depths. My visits to Coron though, is not complete without climbing Mt. Tapyas to catch glimpse of my beautiful sunset. I guess sunsets are more spectacular to watch from a mountain top. I would linger just watching, killing my time looking the horizons getting a good view of the changing hues. Until the golden sun would finally ebbed down and the white cross would light up. This southern most cluster of islands in the country is not a touristy one, in fact some if not most would think twice before coming to Tawi-tawi. Coming here was one of my most memorable trip, the discoveries were too precious to ignore. We visited here during Ramadan and by 3:00 o’clock in the afternoon, the market was oozing with people and there was great array of food! The locals were friendly and helpful, the town is naturally peaceful. We climb Bud Bongao the day we arrived, we trek and were welcomed by the macaque monkeys with our banana offerings. Bud is the highest point of the province, the view was just unmistakably breath taking! The three dives the next day was a great opportunity to explore the rich surrounding waters of the islands. Well, the currents made it challenging! The heights and depths combination was just marvelous! Well, this is actually a combination of three! The southern towns in Cebu have its own charms, so that in these three towns you have equally remarkable adventures. Drive to Mantalungon in Dalaguete, trek to Osmeña Peak and be amazed with those peaks shaped like peanut kisses! Trek down the fourteen kilometers trail and traverse to Badian right in Kawasan Falls, rafting and taking a dip in its aquamarine waters is truly refreshing! 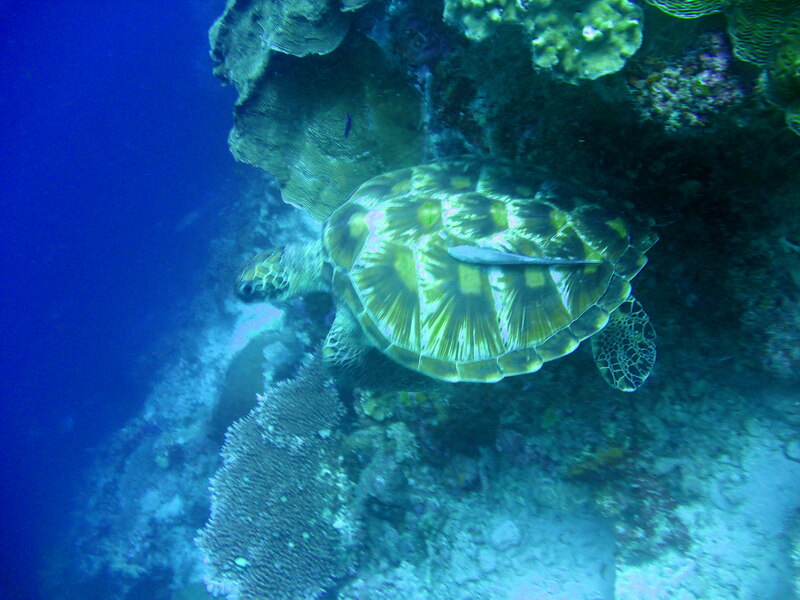 Stay in the next town of Moalboal and dive in its waters replete with diverse marine life. The awesome sardine’s run is too hard to resist, I came here again and again because of it. Pescador Island is also a renowned site, the sightings here are too good to be true, mind blowing as they say! There a lot of reasons to be back here again and again, this island is also my favorite. It’s practically dense with nature wonders. Volcanoes, falls, hot and cold springs, islets, rich marine life and more! Climb Mt. Hibok-Hibok, this active volcano is safe for trekking and it can be done in a day. The view in the peak is undoubtedly breath taking, but it was foggy when we reached the top. We were surrounded with white clouds, the trail was challenging at different levels. It has a total of fourteen kilometers from Yumbing and traverse to Ardent, right in the hot spring pools! A dip is undoubtedly a good relaxant after the arduous trek. The island is perfect for diving – from marine sanctuaries, coastal reefs to sunken cemetery! There’s a lot of choices and this island province is literally surrounded with dive sites in its coastal waters. Mantigue Island is a must, so with sunken cemetery, Old Vulcan, white island and many more. All of the sites are practically filled with diverse marine life. These are just few, I know there are a lot of destinations around the country with this ridge to reef combinations. New learning, precious discoveries and the realization that every place has its own share of wonders and the God of order have made everything in nature in accord with all scheme of things. Definitely my madness of Moalboal is unrelenting, it seems I never get enough of its underwater show. For the nth time, I declare that the sardines’ phenomenon is grand spectacle and literally an iconic one. The mammoth shoal is my overriding reason for coming again and again to Moalboal, and I will never get tired of watching in awe while underwater. It is the only dive site in Southeast Asia that is home to a school of fish so immense, it provides a rare and iconic backdrop of shimmers, shadows and amazing shapes. I was in for a show as I float at fifteen meters watching above me. So stunning! We went again for the 4th time to experience once its majestic display last June, and mutually agreed for another return for this same reason.  Moalboal is a must visit site in the Philippines and if you are after this majestic display of humongous school of sardines, don’t wait long for a trip to this southern town in Cebu. Experience this underwater Shoaltime! Freedom Weekend: Peak, Trails, Falls, Depths! The colorful depths of Pescador Island! Moalboal is one of my favorite dive destinations, despite the disappearance of the phenomenal sardines run in our last visit more than two years ago I have promised myself to be back once more with my dive buddy. The itch was pestering me again since last year especially with the comeback of its marine life phenomena, the anticipation of the return was consuming! The plan involved not just the perks in Moalboal but also the charms of Osmena Peak and the anticipated return to Kawasan Falls after five years. It was another package of adventure – from the heights to the depths! The long weekend in June was all perfect, I just needed a break from work pressures. Osmeña Peak – directly above the town of Badian. The vast sea is decorated with Badian Island. We sped off for Moalboal after a quick stopover at the diveshop in downtown Cebu for Angel’s reserved gear. We were just in time as the van was almost leaving as we got to the terminal, summer’s end gave us a cherry warm welcome in the queen city of the south. The trip was long but the sceneries along the way were enough to absorb my attention. I never get tired passing these southern towns – the old churches, old squares and those big old acacias lining the road! It was first things first – drop off gears at our lodge and see our DM for our Sunday dives. Our friends in our favorite backpacker lodge were there to welcome us, and meeting the new Manager of our favorite dive shop was just heart-warming for the comeback. We passed by towns of Badian, Malabuyoc, Ginatilan, Samboan and changed bus at Bato to proceed to Santander, Oslob, Boljoon, Alcoy and finally Dalaguete – it was dark already. We walked and asked around for our lodge and we were accordingly accommodated. The simple room at Pink House was comfortable enough for an eight-hour overnight, sufficient for a good night’s rest to brace us for the next day’s quest. The next early morning, in a street corner across the old town hall, we found a helpful Manong who carried us with his motorbike to the foot of the peak in Mantalongon. The communities we passed by were already in motion for their daily bustle. The cool morning breeze and the rural scenery was a great start for the climb. We passed by school children on their way, the vegetable farms & backyard gardens and the bagsakan center, where there were ongoing packaging of produce , hauling and the usual trading that accompany with it. It was all green and refreshing. On top of Cebu! A father and daughter scene. Love the cottony clouds! It took only about twenty minutes to climb the peak, but our guide misunderstood us and after walking for thirty minutes wondering where the jagged peaks are – we walked back for the summit which was just behind us. There were climbers already when we looked up, the climb was not arduous but enough to pump more oxygen for the heart! Indeed, the view on top was breathtaking – 360 degrees view of green jagged hilltops, the vast ocean decorated with Badian Island yonder and the blue endless skies! But again, the litters along the trails and on the peak itself were purely disgusting. I picked up a large plastic bag and gathered up all the trash inside. A sad reality – the influx of tourists is always accompanied by unsightly trash. It was an opportunity for a clean-up climb/trek for us. Small falls perfect for massage! Just refreshing! After trekking the trails through the ranges in southern Cebu and traversing the hills in search of Kawasan Falls, the longing for that cool and fresh water was our inspiration to walk past down the winding roads. On the way, we picked up trashes and had a large bagful of litters. After four hours and walking sixteen kilometers, we reached Bukal Springs, the first layer of the falls. After five years we were back reaching in a different entrance and perspective, accompanied with new discoveries. We walked further the trails and had the needed stop in a hut – it was past 12 noon already and we were famished. Believing it was the resort we visited last time, we were surprised of the changes in the spot – well, it’s been five years! Kawasan Falls! Green foliage, gushing waters, aquamarine pool – such wonderful sight. Nothing much has changed since five years ago…. We spend some time on the raft under the falls – soaking ourselves to our heart’s content. It was truly refreshing! Still wondering for the changes of the area, we ended our dip to continue the trails down the highway. But to our surprise, the front layer of the falls was all down there in its splendor! There were more people and guests, and the structures were exactly the same we had five years ago. It’s the same Kawasan we knew – the massive falls, the foliage around the cliffs and the wide pool of aquamarine waters beyond the gushing falls! We lingered for few minutes trying to absorb the marvel of nature’s wonder. 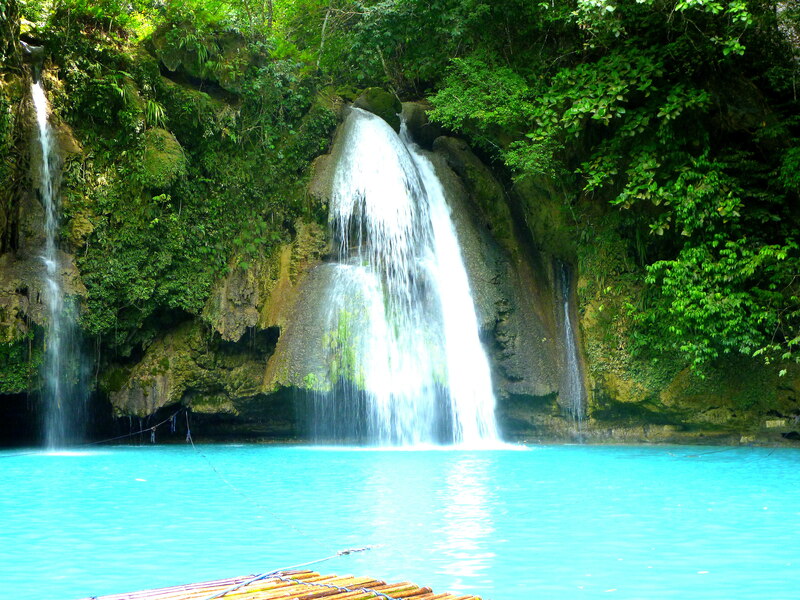 One sheer discovery – Kawasan Falls has three layers, each with different charm and spectacle! The next morning we promptly rushed to Cebu Dive Centre at 8:00am earlier than the appointed time, Cameron – a Briton, the new shop manager deals client seriously but friendly – the professionalism I am expecting from PADI shops. Although we were earlier hinting for Pescador Island for the sardines, he simply dismissed that the run have transferred at the house reef which is easily accessible by shore entry. Cameron, arranged three descents for the day that includes Pescador! We cruised shortly north east of the island, the site is notoriously rough so it is necessary to be early. I was silently thrilled after the short briefing from Danny, knowing that we will penetrate the cathedral – cavern diving again! Indeed, the water was choppy already when we got there. I was last for the entry and Yoyo’s assistance was just needed, the current surface was already strong. Pescador is simply amazing, noted for its mushroom-like formation it held many surprises and its rough surrounding waters added appeal for divers. Indeed, we feasted down under and completely fascinated by array of rare sightings in the depths. We entered the cavern in one hole and had a magnificent view of the cathedral’s holes – while inside in a distance, the lights outside illuminated a human skull. Two eyes, nose and mouth – in an abstract scene, only the focus minded will see. It was like coming face to face with a giant monster underwater. It was rare sight not to be missed! We exited in one of the hole resembling its right eye. There was moray eel, electric clams, banded pipefish, ornate ghost pipefish, puffer and yellow frogfish! We lingered for the rare yellow froggy hoping it would yawn, but it didn’t. 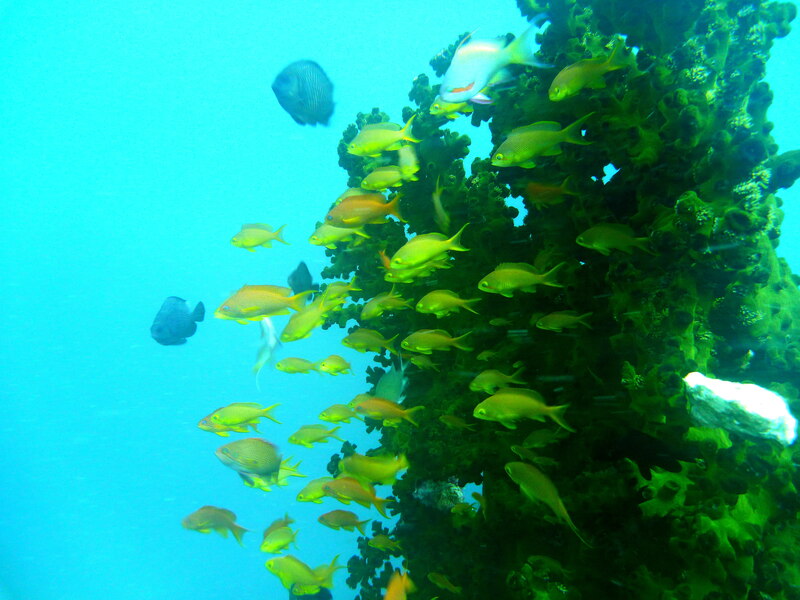 There were juvenile tropical fishes, anthias hovering over corals and variety of hard and soft corals. We ascend after 53 minutes with my air at 70 bars. 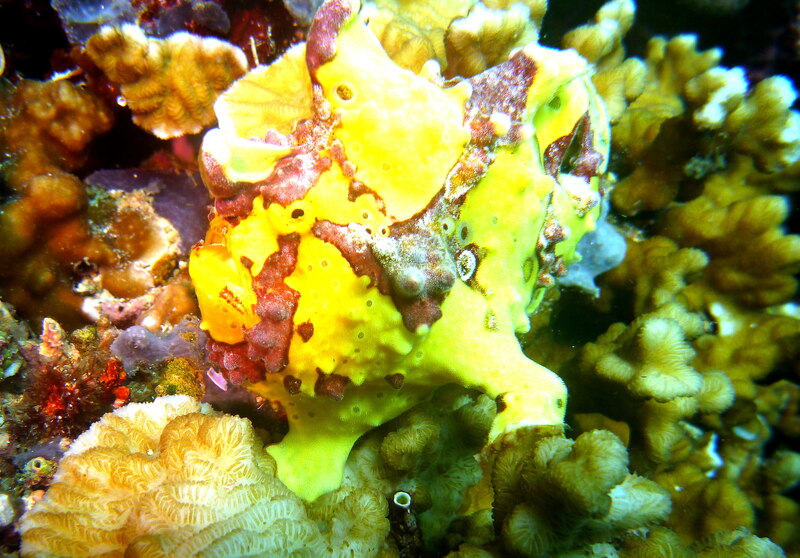 A yellow frogfish – rare find! We escaped the raging waters in Pescador and had our second descent at Visaya Reef. Again, we were not disappointed – we silently roam the slope combing the corals. We sighted cleaner shrimp, trumpet fish, some nudis, puffer, scorpion fish, and the rare emperor shrimp and pygmy seahorse! We swam more and found a resting turtle with a remora, I have to tug Angel’s weight belt to get his attention. It is his favorite specie! Well, he approached and ended chasing it again for photos. We ascend after 51 minutes, my air still at 100 bars. We cruised back for the diveshop, our lunch served as our surface interval. You’ve got a friend – most marine critters live symbiotically. 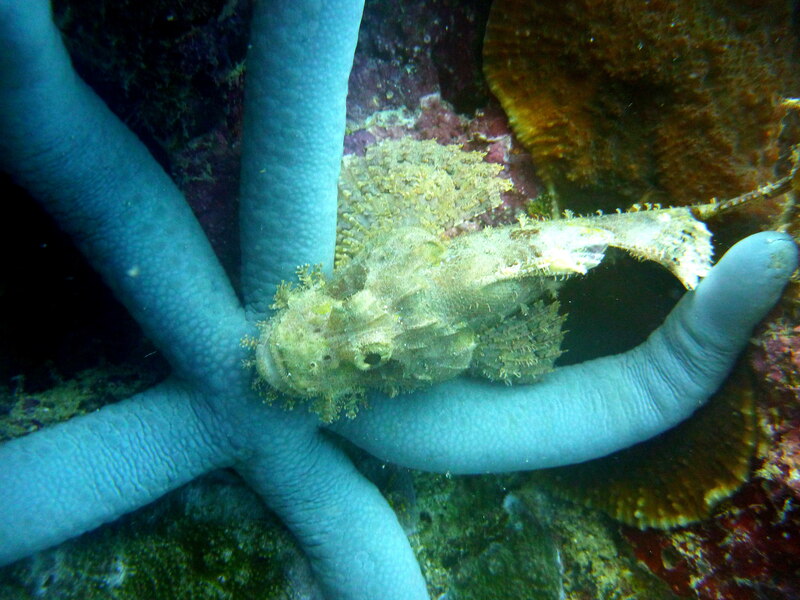 Scorpionfish resting on a blue seastar! Nature has its own works, the transfer of the sardines was one. More than two years ago I was perturbed that it was gone and was silently hoping it would be back in its own right time. Now, this phenomenon graced the shallow waters of Bas Diot just near the shores. I agree with Danny and Yoyo that the sardines are safer in their new abode, the shores are patrolled and nobody could fish them. They could freely swim without fear of predators. Larger fishes would rarely come ashore! Donning my gears on water, we readied for our last descent to experience once more the phenomenon. Not far, we were at 15 meters and as we looked up, the large herd darkened above us, probably just five meters from the surface. We swam getting a good view and the whole stretch was literally decorated with the fishes grouped together – probably millions! It was such a rare sighting. We literally got the whole stretch covered, immersed in the afternoon waters swimming coyly, feeling the serenity of the waters. I belong with the marine life, as if I was one with them in spirit. There were at least eight sightings of turtles randomly darting in our view adding more splendor to the scene. The sardines run is like a mighty storm! Angel was just nearby, it was necessary as I don’t have dive computer and we both agreed not to get lost. Unexpectedly, he held my hand and looked in my eyes. As if saying, “It’s beautiful, do you like it?” I looked back and gripped his hand affirming, wanting to smile but can’t. We both love the sardines run, how can anyone ignore the exquisiteness of creation? How can anyone disregard the treasures in marine life? We swam back to shores after 50 minutes still enthralled of the sardines and turtles. For sure, there’s more in southern Cebu – dive sites in Badian and Oslob; beaches in Dalaguete and Alcoy; old churches, museum, town halls; and pristine white islands. But again, it was about seizing moments and doing what one love most. I adore the mountains and my incessant passion for the depths is unrelenting. The three-day trip was a perfect climb, trek and swim quest rolled in one – coupled with new learning and discoveries. Yet when we head home, we agreed for another return. It’s pure madness I guess – a kind of madness that keep my sanity because it is with nature that I find my equilibrium!